Fully automatic shoe cleaner with 4 brushes for side, top, bottom cleaning. This shoe cleaner removes all types of contamination from most footwear. The fully automated Model 2001-TB has 4 motor driven brushes that clean sides, top, and bottom. A weight loaded top brush fits the contour of upper shoe surfaces (including shoe laces.) Unit powered by a special low rpm, 1/6 HP electric gear motor that operates on 120v, 60 Hz. Cover is rotomolded white polyethylene. Removable hood secured by 4 latches. 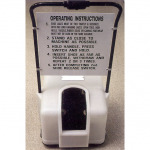 Operating instructions (included) printed on plastic sign attached to personnel support handle. 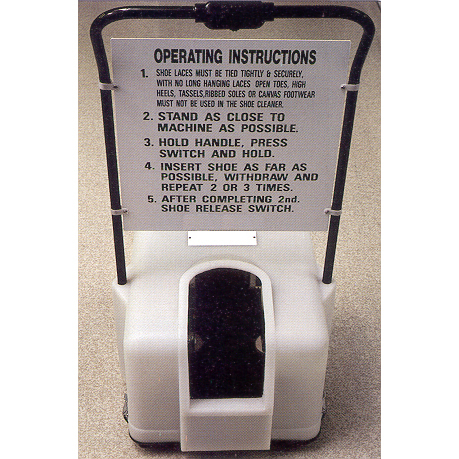 A control switch is conveniently located on top of handle. Handle helps maintain balance.